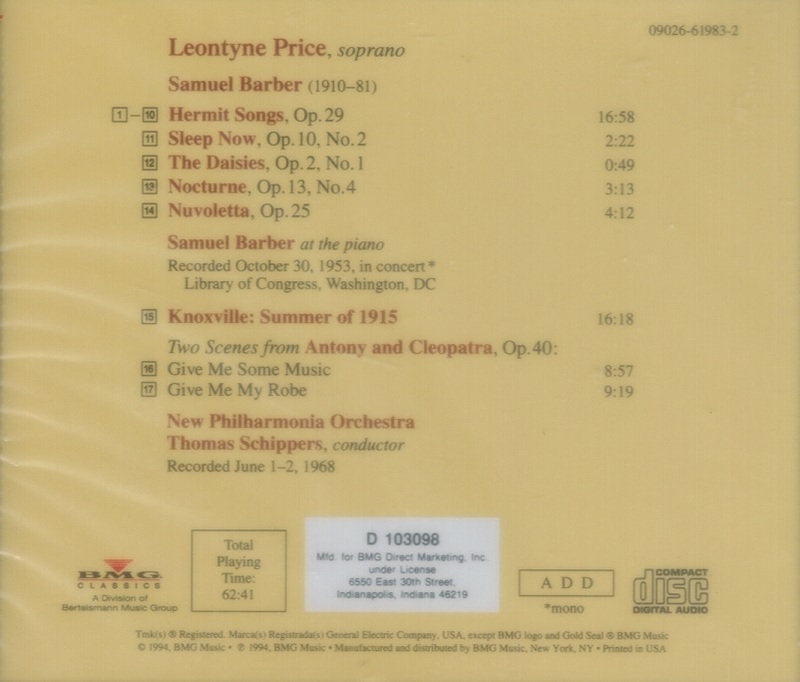 "...the Leontyne Price disc is indispensable, as hers was one of the composer's favorite voices and the one for which the 'Hermit Songs' and ANTONY AND CLEOPATRA were originally intended and for which the latter, at least, was ideally suited....she and her voice were important factors in Barber's career as a vocal composer. 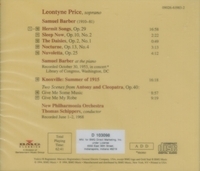 Available for the first time on recording is the world premiere performance of the 'Hermit Songs', done, along with four other songs, at the Library of Congress in October 1953 - one year before the famous studio recording - again with the composer as pianist - that has long loomed as the definitive performance of this cycle (currently available on Sony MPK-46727 [V2391]). The sound quality is, of course, better on the studio recording, and the performances are more secure, but some nice touches of spontaneity emerge from this concert document. Incidentally, the reading of 'The Daisies' is something of a revelation, as Price and Barber give it a quick, almost casual light-heartedness that is quite different from the way we are accustomed to hearing it. Though KNOXVILLE was never 'hers', Price characterized the work with a boyish innocence that penetrated more deeply than many other otherwise superb versions. 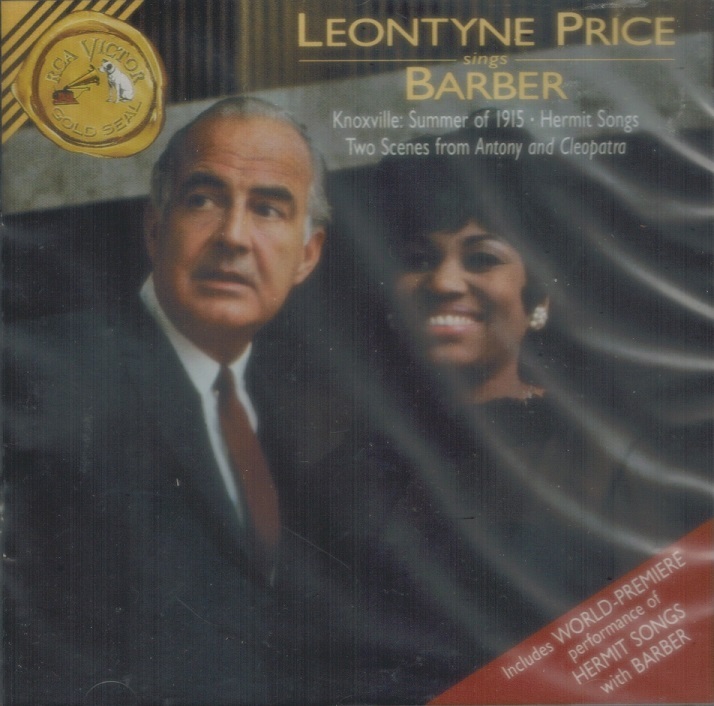 KNOXVILLE has been the beneficiary of many excellent recorded performances, but Price's is as fine as anyone's. Despite its unpromising beginnings, the 1966 ANTONY AND CLEOPATRA has since been steadily winning admirers and vindicating itself as one of the composer's mature masterpieces, and Price's towering performances of these two scenes have been a significant factor in rehabilitating its reputation. Listeners not yet familiar with the opera, or with the dramatic scene 'Andromache's Farewell' or the choral cantata 'The Lovers', have major musical epiphanies awaiting them."